I’ve been meaning to make a risotto that involved chorizo for quite some time so when Adam announced this morning that he’d really like risotto for dinner I decided tonight would be the night. Not having a recipe that quite hit the mark I decided to experiment and wandered about Woolworths popping anything that seemed like a good idea into my trolley. As I began cooking tonight, Tom asked my Mum if she was staying for dinner – she’d been helping out with the kids’ homework as she often does on a Monday afternoon, because she is made of all kinds of awesome. I warned her that I was inventing and said that of course she was welcome to stay and yes, I was sure there’d be plenty of food (mostly because I was pretty sure the kids wouldn’t eat much). I was right about Caitlin not eating and Dave wasn’t overly thrilled, but Mum had seconds and Tom asked for thirds! Heat the stock and wine in a saucepan and keep it at a low simmer. In a large non-stick pan cook the chorizo until it begins to brown, drain the fat then add the mushrooms, once the mushrooms are cooked remove both from pan and set aside. Add oil, butter, leek and garlic to pan and cook until transparent. Stir in the rice until well coated. Add the stock 1/2 cup at a time stirring constantly over a medium heat, each time waiting until all the liquid is absorbed before adding the next 1/2 cup. About half-way through drain and reserve any juices from the mushrooms and add the juices to the pan. Once all the stock has been added taste test the rice, if it’s still a little on the firm side add hot water in small amounts and continue stirring until the rice is cooked through. Add the mushroom and chorizo mix, the diced capsicum, sliced smoked chicken breast and spinach. Stir gently until the spinach has wilted. Serves 6 people as long as 2 of them think you are poisoning them. On any given night in our house at least one thinks we are poisoning them – it's just never predictable which one it will be. Yummy! 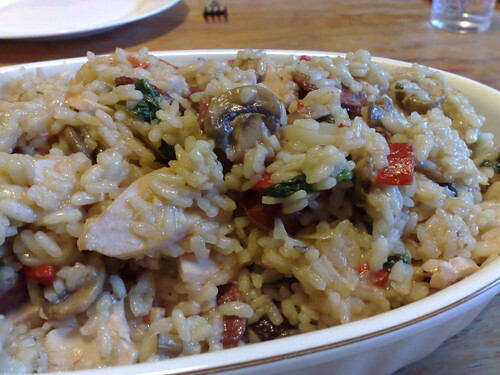 I sometimes make a risotto with chorizo, but I tend to make a very plain risotto (olive oil, garlic and onions soft fried, then arborio rice and chicken stock – preferably home made but that only happens about twice a year) and then I toss chopped snowpeas and chunks of chorizo through at the end. But I think I could easily be tempted to make it your way instead. Yum! Recipe posts are my favorite! I love risotto but have never made it… too scared to mess it up. You have inspired me to try it — maybe this week. Also, thanks for visitng my blog and for your kind words — I needed that! Sounds and looks really tasty. I don't blame Tom for having thirds. If I could get chorizo I would be making it tomorrow! yum. I loves me a risotto. Made this again tonight, this time with onions in place of leeks and fresh red capsicum and asparagus instead of the roasted red capsicum and spinach. I cooked the capsicum and asparagus with the chorizo and mushrooms. I've added a note about the stock, it really needs to be low salt because the meats are quite salty.